The Exotic quest to unlock The Last Word in Destiny 2 will arrive tomorrow, so Bungie dropped a short teaser showing the beloved handcannon in action earlier today. 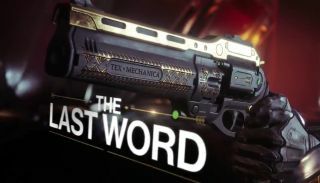 It's great to see The Last Word shred folks in the Crucible again, but the best part of the teaser is right at the end, and it's not actually about The Last Word. It seems that Thorn, another fan-favorite Exotic handcannon, is next in line for Destiny 2. According to today's teaser - which says "every hero needs a villain" and, more obviously, shows Thorn's patented nail-like rounds embedded in a wall - Thorn will arrive in the Season of the Drifter, which kicks off in March. The next DLC in Destiny 2's annual pass, Joker's Wild, coincides with the Season of the Drifter, but it's unclear whether Thorn will be available to everyone, or reserved for annual pass owners. Looking at the annual pass roadmap, Joker's Wild and the Season of the Drifter contain one Exotic quest apiece, and either of them could be Thorn. Given The Last Word's Black Armory exclusivity, I'd bet that Thorn is indeed tied to Joker's Wild. If nothing else, both Exotic quests are listed under April, so we can bet Thorn will arrive around that time. You'll find everything you need to know to get the Destiny 2 Last Word in our handy quest guide.